Our June trip is right here in Canada! On Saturday after I completed a morning workshop facilitation gig, we headed off to northern Alberta. The trip's destination this year is Yellowknife. Alberta's north has always lured us in. The majestic views, the unique geography and the relentless pursuit of residents to enjoy every daylight hour. I think this can all be traced back to starting our lives together in Fort McMurray. The draw of the night sky and the aurora borealis is never forgotten. Our first stop is Grande Cache. 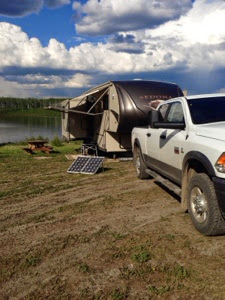 We had hoped to stay at Pierre Grays Provincial Park but waited too long for reservations. Thus we ended up at the Grande Cache municipal campground. And this is how you find hidden gems. The campsites are huge private sights with towering evergreens all around. And the best part was a chance to visit with our friend Yvonne. I first met Yvonne when I started work with Volunteer Alberta in 2010. We were soul mates from the start. And as we were the 2 project staff assigned to northern Alberta areas, we had an immediate bond. Yvonne has visited us many times over the years and I was thrilled to finally return the favor. We had a great stop in her town and a great visit with her! And I can't not mention the scenery around Grande Cache. The mountains are breathtaking right now. Looking out the window at all the green life, you see a circle of light and snow covered mountains on the other side. So beautiful! Next on the list was Grande Prairie. We picked Saskatoon Island Provincial Park to unhook. This stop was a bit miserable on the weather side, but we enjoyed exploring the city. And the campground offered lots of opportunities for walking and exploring. There is an area where you can try your luck at sighting protected trumpet swans. We may have spotted one across the water, but as you can see the photo gets a bit fuzzy at that distance. And no Don cannot get another lens for the Nikon! Our last stop before the Northwest Territory border was Hutch Lake. Don spent many weeks of 2013 working in this area and during that time inadvertently discovered a gem of a campground at Hutch Lake. Of course that was while finding the Hutch Lake gravel pit. We would not normally choose the overflow sites when camping but I'm sure this photo convinces you we made the best choice. We spent an afternoon shopping in High Level, and had a lovely dinner with Dean as our guest. Tomorrow we will cross the Alberta/NWT border. I can't wait to tell you all about that!